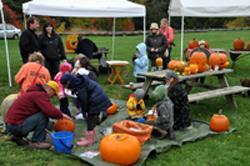 Sensational Pumpkin Day is a free family event celebrating the end of the harvest season; it's all about the pumpkins. There will be pumpkins available for children for carving and/or decorating (for prizes). There will be a professional pumpkin carver demonstrating his carving techniques on a giant pumpkin (available to win in a draw at the end of the day). There will be pumpkin ice cream, provided by Mapleton Organic. We will also have entertainment throughout the event including dancers, face painting, a bouncy castle and music provided throughout the day.